I will be contacting you soon so that we can send you your Cora's package. who gave so generously to the Johnsons. And I am so excited to be able to help Calla and her family in this way. Don't forget there will be another giveaway next week. Lots of pretty things to come!! If you were wanting to donate items for the giveaways you should have received and e-mail from me today. E-mail me again, if for some reason you didn't get it! Thanks again for helping! A few random things today. I got Levi's pictures back this week. Megan took them and they are amazing. She made it out of scraps from all of the Cora dresses. You can check out more of Levi's pictures at Whatever. If you are still looking for a way to give to the people in Haiti, check out The Rusted Chain. 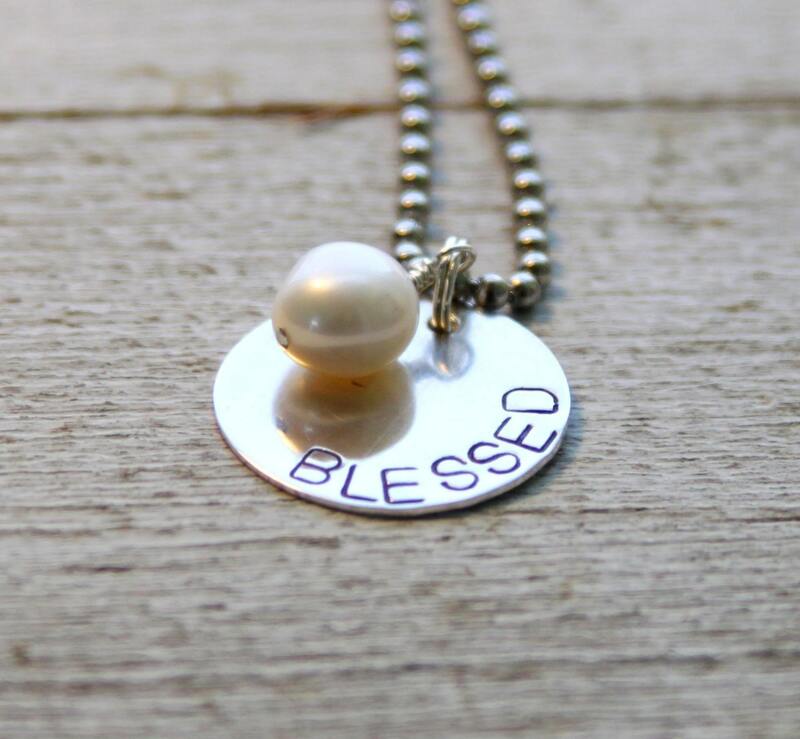 Beki is donating $10 from every Blessed Necklace sold to Compassion International to help with disaster relief if Haiti. She has raised over $2000 already! The first Cora's for Calla giveaway will close at 12:00pm today. I will randomly select and post the winner later today. Don't forget we will be doing a giveaway each week until Calla comes home. There are many other Etsy vendors donating items for the giveaways. I can't wait to show you what else we have! Levi is not a big fan of bath time. The first two weeks he just screamed. I know that is normal, but I think this mama and daddy forgot. Of course she screamed at first too. But, we have such good memories of bath time with her. Cora always liked bath time with daddy better. I got the camera and video camera ready. 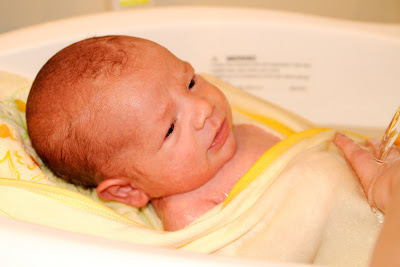 and I wanted to videotape Levi's first bath too. and by the end we were all in tears. 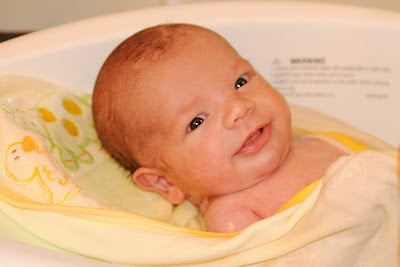 But his mama and daddy were missing Cora and all the "fun" bath times. This bath and the screaming wasn't so fun. We know the fun bath times will come with him too. After all the poor guy was only a few days old! It was just one of those many things that caught us off guard. and our hearts just hurt. This week bath time has become much more enjoyable. but at least Levi is not screaming through the whole thing. And mama and daddy aren't crying anymore either. like he was going to smile at us. And there is nothing better than cuddling with a squeaky clean baby! If you are wanting to enter the Cora's for Calla giveaway leave your comment here. Don't forget the first Cora's for Calla giveaway is open until Friday at noon. If you are wanting to enter the giveaway make sure to leave your comment here. Grab a Calla button and post it on your blog. The code is on the left sidebar. Join us in praying for Calla. One year ago today, our lives changed forever. we would be fighting for our daughter's life. And in just 17 short days, that we would loose that fight. That day we were asked to begin a new journey. It was a pretty typical day. I dropped Cora off at my mom's and headed off to Bible Study. She had been having trouble sleeping and was a little grouchy. Those horrible ear infections kept coming back and I was wishing she would just get better. At Bible study I remember sharing my frustrations and asking for prayer for Cora and her doctor's appointment that afternoon. Joel had agreed to go to the doctor appointment with me. We wanted to do everything we could to get Cora feeling better. 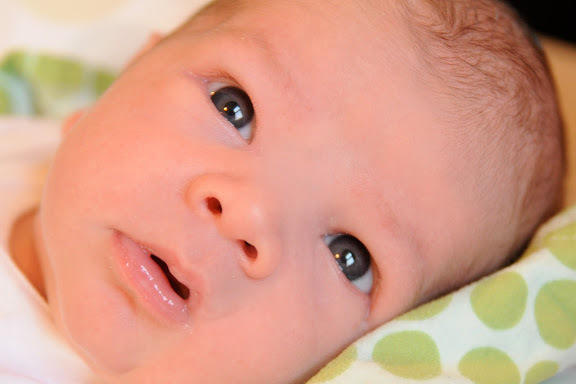 We had no idea that it was so much more than a little ear infection. I remember sitting in the exam room with Joel and Cora. We were trying to keep our little girl happy as we waited. They had done an x-ray of her abdomen and she did. not. like. it. one. bit. She screamed through the entire thing. We really didn't expect anything to be horribly wrong. We were just looking for a way to get rid of the ear infections. But as we waited longer and longer, we began to worry. We sensed something might not be okay. Still, "cancer" had never crossed our minds. Our pediatrician finally came in. I knew the second I saw his face that something was wrong. As he told us that Cora's liver was enlarged and that it might be the result of cancer, our world as we knew it froze. He was so kind to us. Even prayed with us before sending us out the door. But I was in shock. He had to be wrong. There was no way my beautiful Cora had cancer in her little chubby body. Joel and I could barely even talk to each other as we drove to the hospital. I remember praying over and over all the way there, "Please let him be wrong. Please let him be wrong. My baby can't have cancer." But as we know, he wasn't wrong. Late that night our worst fears were confirmed. The next day we would be asked to hand our sweet daughter over for surgery. And from that moment on our world was rocked to the core. We went from a "normal" family to living in the hospital and struggling to battle Cora's cancer in an instant. We were asked to trust God with our daughter's life. We were asked to trust God in a way that we never had before. As I think about that day and the 17 days that followed, my stomach just aches. I don't even know how to describe our time in the hospital except horrible and terrifying. It was the worst thing to watch Cora go through everything she did and not be able to do anything to help her. Like I said, it is hard to even put it into words. 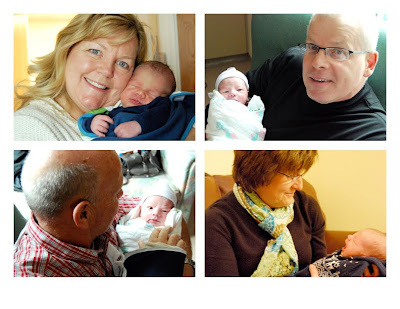 Yet at the same time we experienced God's incredible comfort through the wonderful hospital staff, family and friends in a way that we never have experienced before. It was amazing. So many people have told us that we are handling this past year of suffering incredibly. That they would not be able to handle what we have gone through. Like we are "gifted" at facing difficulties. We are not. In fact, before Cora got sick, I would have said the same thing. I would have said there is no way I could handle watching my daughter battle cancer. Or worse yet having to say goodbye to my daughter. I would have told you I couldn't do it. 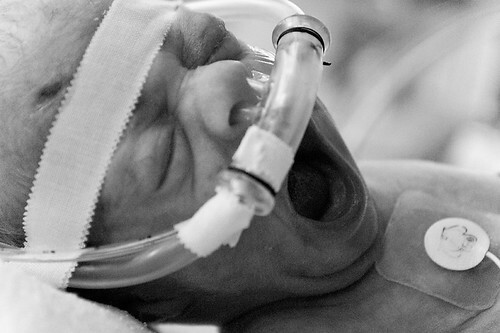 When we were in the hospital I remember people telling us that God's grace is sufficient. Those words seemed so trite to me considering what we were going through. But, through this year we have found that God's grace is truly sufficient. It is that simple. It doesn't mean that facing suffering is easy or that it doesn't cause pain, even deep pain. But it is true. When we face something that seems impossible to live through, or even when we face something that seems relatively insignificant, we can be confident that He cares. He will provide just what we need to get through whatever we are facing. His grace is sufficient. My family is living proof of that! So as we enter this time of "anniversaries" and remember what we were facing at this time last year, and what we continue to face every day, I need to remind myself again. His grace is sufficient. 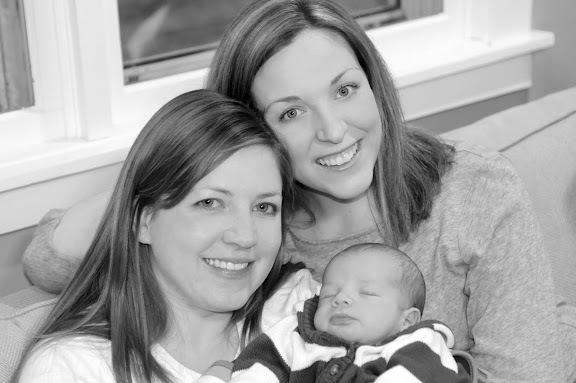 When Levi was born, I think our families needed hold him as much as we did. They were all with us when we lost Cora and have walked beside us during this hard, hard year. They were ready to share in a little joy with us. Levi has so many people to love on him. I don't think we will ever need to worry about finding a babysitter either! All of them but three. One of Levi's uncles was in China. And we somehow missed getting pictures of his other two uncles. Kids weren't allowed in the hospital. This made for some very sad cousins who wanted to meet Levi so badly. They had to settle with peeking at him through the window instead. When Levi came home he got lots of lovin' from all the cousins. They each wanted a turn to hold him. And yesterday he finally got to meet his last uncle. Levi, you have no idea how much you are loved! 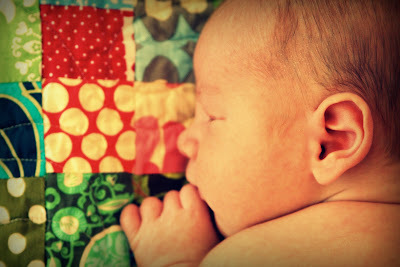 It is hard to believe that just a little over two weeks ago we were meeting Mr. Levi for the first time. He has been such a sweet little boy. Nearly perfect. At least we think so. Someone told me that God knew just what we could handle right now. I think that is so true. The past two weeks have been emotional as we experience new things with Levi and yet grieve for Cora in a whole new way. Levi is a blessing no matter what kind of baby he is, but it has been an extra blessing for him to be so good! Joel and I took Levi to his two week appointment on Friday. I was a total wreck the day before. I think I cried about anything and everything that day. 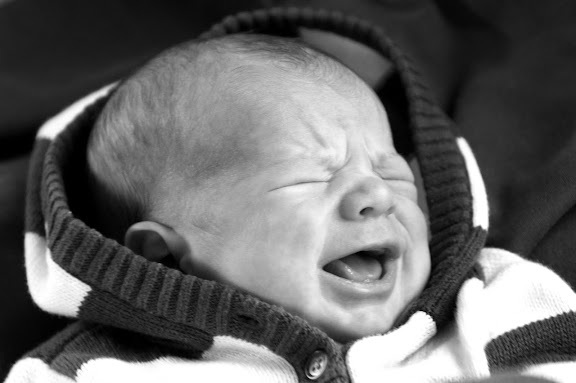 I wasn't sure what was triggering all those tears (besides the obvious), but I am pretty sure it was just the anticipation of going back to the pediatrician's office for the first time. We hadn't been there since the day we found out Cora might have cancer and were sent straight to the hospital--almost one year ago. When we checked Levi in for the appointment it was so weird. They asked who the appointment was for and I had to catch myself from saying Cora instead of Levi. I had been there so many times with Cora last year. As we waited in the waiting room I just cried. So many memories were rushing back. I was a little worried that I wouldn't be able to compose myself when they called us back, but somehow I did. Our pediatrician is wonderful--he is the same one we had with Cora. He was so excited to see us again and meet Levi. I felt such a peace when we were sitting there talking to him. Levi had a great appointment. Everything looked good and we are so thankful. I don't know if I will ever take one of these "good" doctor appointments for granted again! Oh, and here is proof that Levi does cry. Really. Not very often though. Like I said, he is a really good baby. We ended our week with a visit from my dear friend Laura. She lives in Colorado and we have been best friends since 5th grade. We have been through a lot together! 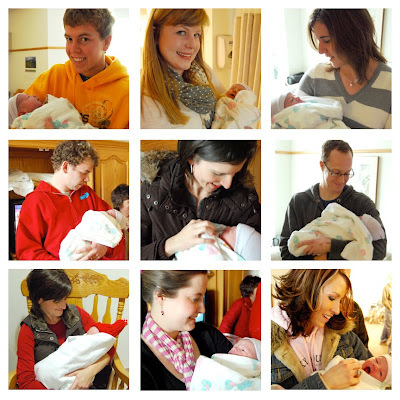 We had the whole weekend to catch up and hold little Levi. Laura is a photographer and taught me some new tricks on my camera. She took the first two pictures of Levi. We also got to spend some time with Julie and meet sweet Calla. Thanks for coming Laura! It was so good to see you. We brought Levi home last Monday and it has been freezing cold here in Kansas ever since. We have spent most of our time at home so far, trying to keep warm--holding Levi as much as we can and trying to soak up every minute. Levi has been such a good baby. We are spoiled. He has been doing lots of sleeping and eating. He is even sleeping pretty good at night. 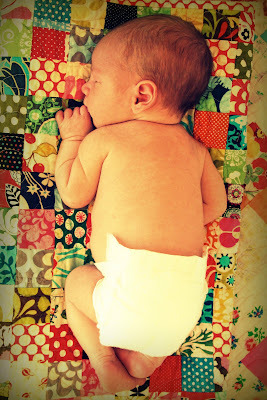 I am still trying to get used to changing a little boy's diaper--so different from girls. I have ended up in the middle of a few big messes! My mom stayed with us the first few nights to help with Levi. It was so nice to get a little extra sleep. Thanks mom! As you can see little Levi has worn us all out! On Friday morning we woke up to a freezing house. Our heater wouldn't turn back on. We stayed in bed most of the morning and tried to stay warm while Joel got someone to come out and look at it. Thankfully it was fixable, but we decided to venture out into the cold and get some lunch while the house warmed back up. We took Levi to one of our favorite places for some greasy burgers and fries. Yum! It was nice to get out of the house for a little while. Levi is sweet, sweet, sweet. While the past week has been emotional as we transition again, we are so thankful for this little man. I was hoping to get these pictures posted on Saturday (when he was actually a week old), but we have been too busy getting to know our little Levi. We are enjoying every minute with him! We had a really hard time picking names this time. Especially boy names. We really wanted the name to be significant and have meaning. It took us a long time to decide on Levi's name. 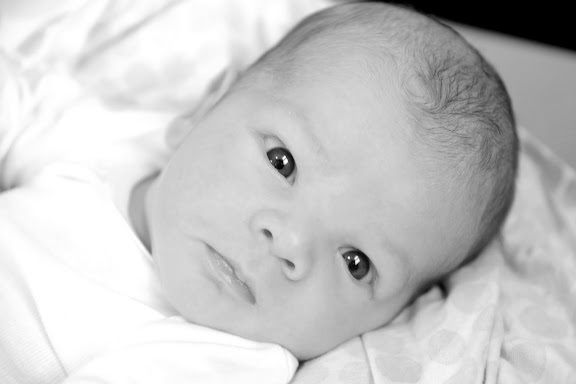 Joel decided about a month ago, but I wasn't sure until the day he was born (that is pretty typical of the differences in our decision making skills!) But now we love the name. It is perfect for our sweet little boy. When we added Levi to our list of boy names we started reading about who Levi was in the Bible and the meaning of the name. Levi means "joined". That seemed fitting as our family has felt anything but joined since Cora went to heaven. We know that even though our family does not seem complete here on earth we will one day be joined together again in heaven. We can't wait to tell Levi all about his big sister. We are praying these verses for our Levi. That he would grow to be a man who walks in uprightness and stands in awe of our Lord's name. Jerald is after Joel's dad. Joel's dad, Jerry, is one of the kindest, God-fearing men I know. He is a hard worker, is dedicated to serving the Lord in both his occupation and his every day life, and has such a servant's heart. Anyone who knows Joel's dad would understand why we would also want our son to have this name. Jerald is also the name of Joel's great, great uncle, Joel's grandpa, and is Joel's middle name. We had to carry it on one more generation! And here are a few more pictures of little Levi from the hospital. Thank you so much for all your kind comments--we were overwhelmed! We appreciate your prayers SO much. We told Levi that he is famous already!